Cycling in Cape Town can be done at your own pace, is environmentally friendly, sociable, almost anyone can afford it and, let's face it, there's nothing quite like free-wheeling down the coastal roads of the Cape Peninsula with the wind billowing through your hair and the sun on your back or soldiering up a steep hill for a stunning view of False Bay at the top. Cape Town's natural environment is abundant with tarmac roads, single tracks, switch backs and jeep tracks to suit everyone from the leisure cyclist to the technical rider. There's never been more of an excuse to swap the car for your own steam. Observe eland, bontebok and puff-adders along fybos-lined undulating tarmac roads towards the Cape of Good Hope (the southerly most point of Africa). Cycle back along the tarmac roads or leave them behind to hike along the ridge of the Cape Peninsula for lunch at popular picnic spot Buffelsbay (AWOL Tours | +27 (0)21 418 3803). Read more about AWOL's Cape Peninsula Cycling Tour. Technical riders should start with a steep 500m climb out of the trail car park up and around the quarry lake before turning left onto a piece of single track where two switchbacks bring you high above the farm. Follow the route along the stream in the Kloof Forest, which is cool and dark during summer and sheltered in winter, before a series of switchbacks lead to the top of the opposite hill with views of Robben Island. Your downhill descent is an exhilarating rush to the bottom that dives back into the Kloof before exiting above the farm restaurant (Tygerberg MTB Club | +27 (0)72 852 8272). From the beachfront in Camps Bay the route takes in stunning views of Camps Bay, Clifton and Lion's Head all the way to Suikerbossie and down into Hout Bay Village. When you reach the first set of traffic lights in Hout Bay, turn back up the short hill before a downhill coastal cycle back to Camps Bay. 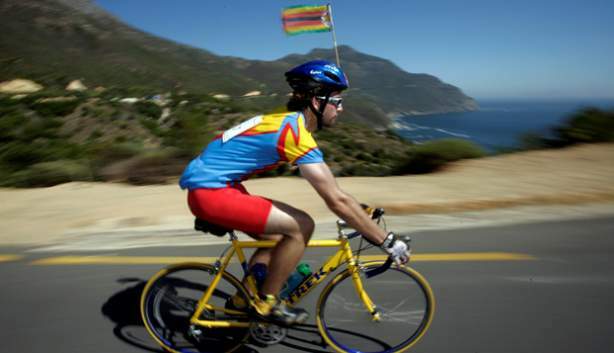 The more energetic might want to carry on past Hout Bay to Chapman's Peak Drive. 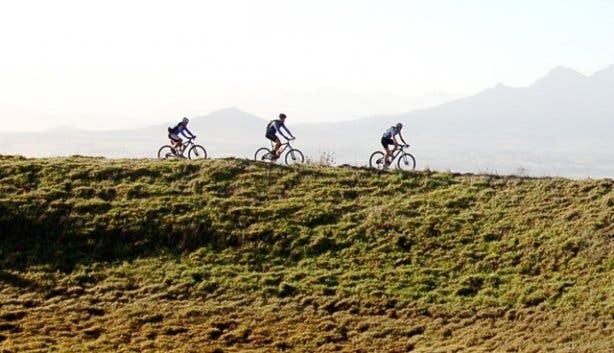 The annual Robertson Cycle Challenge starts at Robertson and follows the tar road which includes a long gradual incline past the Breede River Bridge. Cycle through the beautiful wine farms surrounded by mountains, pass through Bonnievale Cellars and return via hill climbs and descents. Follow the green trail around the lower end of the farm taking in the vineyards, old farmhouse and picturesque dam along the wide track. Take the single track across the contours of the hill from one side of the farm to the other before a short 200m hill takes you up to the next contour where you can traverse the hillside below the fynbos, above the vines, around a blue gum forest and home via the dam (Tygerberg MTB Club). From Simon's Town ascend one of the Cape’s steepest climbs, Redhill, before a fast-paced descent to Cape Point and on to the start of Smitswinklebaai. Riders have a fast and scenic 15km back to the start. During the challenge solo riders are required to complete a minimum of four laps of the course totalling 116km and cycling veterans have been known to clock well over 200km. Starting at D'Aria, pass through Bloemendal, Majik Forest and up via Maastrect through the electric fence gates and down into the Tygerberg Nature Reserve. 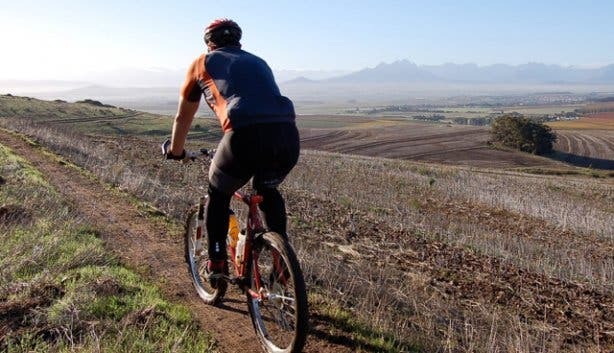 Although your ride through the nature reserve involves lots of climbing (up to 1200m of vertical gain) you can spot a variety of birds and rare plant species along this picturesque route (Tygerberg MTB Club). Climb the winding gravel roads from Rhodes Memorial to Kings Block House with stunning views of Table Bay and False Bay to reward you at the top. The undulating ride back along Tafelberg Road passes the cableway and transcends down onto Signal Hill Road. Still feeling energetic? Complete the beautiful Full Moon Hike up Lion's Head afterwards (AWOL Tours). The circle route around Plum Pudding Hill is ideal for family outings as it is not challenging and there are toilet facilities and adequate parking. Start on the tar road leading towards Rhodes memorial and follow the well marked path which affords views of the Cape Flats, Table View and the Hottentots Holland mountains. Ride through fynbos, forests and streams with only one short steep section to ascend Plum Pudding Hill. 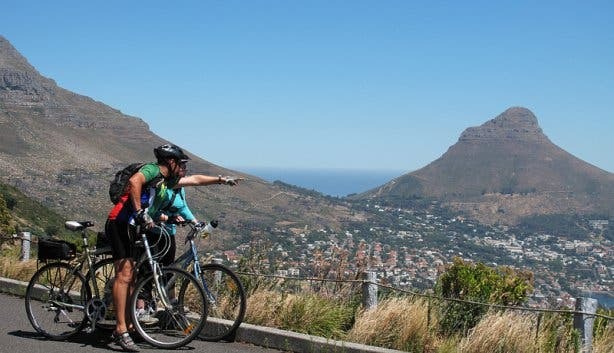 Get all the info on the Cape Town Cycle Tour. Be sure to read our 10 top hiking routes and our 10 top running routes in Cape Town and surrounds.